Fresh off a grueling primary election last week, U.S. Rep. Jesse Jackson Jr. (D-Ill.) checked in with The Root on Friday via email to talk about his landslide victory against former Rep. Debbie Halvorson. He discussed his priorities, which include building a new airport outside of Chicago and using legislation to increase health care and health security for Americans. He also talked about the first test of the state's new congressional map, which appeared to work in his favor during last Tuesday's election. Jackson, who first won office in 1995, also addressed the grueling race against Halvorson, which was made difficult by a House Ethics Committee probe into allegations that he attempted to trade campaign contributions for an appointment to Illinois' U.S. Senate seat vacated by President Barack Obama. Despite the cloud, he was able to garner 71 percent of the vote, while Halvorson won 29 percent. As he prepares to face Republican challenger Brian Woodworth in November, Jackson talked to The Root about what he hopes to accomplish if he is elected to a new term. The Root: Congratulations on your win, Congressman Jackson! You first won office in 1995. Why did you face such a grueling primary competition? 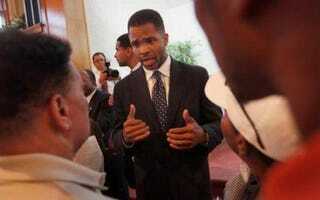 Jesse Jackson Jr.: I didn't consider it grueling. I considered it democracy. My opponent was correct in saying that I have not had a serious primary challenge since my initial election in 1995 — but I was up to the challenge. The challenges were that Debbie Halvorson was a former member of Congress. I was running in a new district that was urban, suburban, small town and rural. The question was, could I win in such a district? I had a good message. I put together a good re-election team, and the result was I won with a significant 71 percent of the vote. And I intend to represent all of the people in the new 2nd Congressional District, from urban consumers to small businesses to rural farmers. What most people don't understand is that the Congressional Black Caucus has one of the strongest voting records when it comes to farmers and small businesses. We don't just represent African Americans and urban concerns. My district now is only 54 percent African American. Indeed, the 2nd District now reflects Illinois. Illinois, indeed, reflects most of America. TR: Halvorson made a pending House Ethics Committee investigation over your alleged ties to ex-Illinois Gov. Rod Blagojevich part of her campaign. Are you concerned? Can you express your thoughts about the investigation? JJ: I have not been charged with any wrongdoing. I have never appeared before a grand jury. I never offered or authorized anyone else to offer Gov. Blagojevich anything, and he never offered me anything. I have been informed by the government that I was not a "target" in the investigation. I testified in the Blagojevich trial, and neither side challenged my testimony on the witness stand. I and my staff have fully cooperated, and we will continue to do so until the end of the process. And at the conclusion of the investigations, I fully expect to be vindicated. TR: The state's primary election — closely watched by both Republicans and Democrats — was the first test of its new congressional map, based on new census data and drawn by Illinois Democrats to carve territory in their favor. Were you surprised by the outcome? JJ: As you probably know, I wanted to make sure that the new map was in compliance with the 15th Amendment of the U.S. Constitution and Section 5 of the 1965 Voting Rights Act, which outlaws discrimination in voting on the basis of race. There was a possibility that [a Hispanic district] may have deserved a second seat in Congress from Illinois, but three federal appellate-court judges found that the drawing of the Democratic map complied with the law, so I was satisfied and happy with the result. TR: Can you explain what you hope to accomplish during your next term and how it fits with President Obama's agenda on economic recovery and health care reform? JJ: First, if you followed the race closely, you know that a lot of my focus was on completing the process to start building a needed third major airport in the Chicago metropolitan area under the authority of the Abraham Lincoln National Airport Commission. I saw the vote on Tuesday, in large part, as a mandate and a message to Gov. [Pat] Quinn to build the airport now. The governor holds the key. We already have two world-class developers committed to building and running it and investing $700 million of their own private funds in this public-private project. The ultramodern airport will serve as a major magnet to bring jobs — 1,000 construction jobs initially and 15,000 permanent jobs — on the day it opens. Obviously, it would also bring hundreds of new businesses and bring the global economy to the 2nd District with nonstop service to anyplace in the world. So it would be innovative, create jobs and businesses and bring balanced economic growth, all of which President Obama supports. Second, with regard to health care, even though I supported a public option in the Affordable Care Act and personally prefer a single-payer or Medicare-for-all plan, I voted for the bill because it moved us forward on the road to providing high-quality health care for all Americans. I will continue to fight to increase health care and health security for all Americans through incremental legislation.